Lightly grease an 8×4 inch loaf pan. In a mixing bowl, beat together butter, 1 cup sugar, juice and eggs. 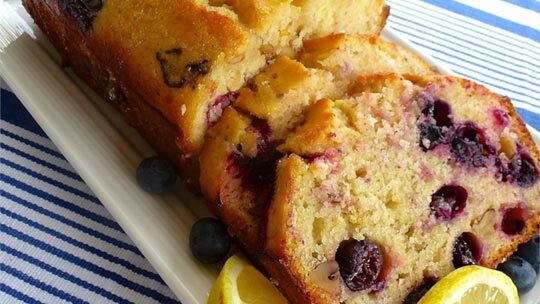 Fold in lemon zest, nuts, and blueberries. Bake in preheated oven for 60 to 70 minutes, until a toothpick inserted into center of the loaf comes out clean. Cool bread in pan for 10 minutes. Meanwhile, combine lemon juice and 1/4 cup sugar in a small bowl.